One of the twelve Apostles of Jesus; he betrayed his master and delivered him up to the priests for judgment (Matt. x. 4; Mark iii. 19; Luke vi. 16). That Jesus should have shown so little foresight in the choice of an apostle naturally caused great perplexity to his followers; and consequently the Gospels present the facts of the betrayal as well as the character of Judas from partizan points of view and in different ways. According to Luke xxii. 3-5 (comp. John xiii. 27) Satan entered into him while he sat at the table, among the rest of the Apostles, to partake of the Passover meal, and he left to commune "with the chief priests and captains, how he might betray" Jesus, while they "covenanted to give him [Judas] money." In Mark xiv. 10-11 Satan is omitted; in Matt. xxvi. 15 the price of thirty pieces of silver is given with a view to the Christian interpretation of Zech. xi. 12 (comp. Matt. xxvii. 3-9 et seq.). Possibly the story that Judas was moved by avarice is a later invention. In fact, the tendency to make Judas the type of greed is manifested in John xii. 4-6, according to which passage he was a thief who misappropriated the money in the common treasury of which he had charge; therefore he objected to having fine ointment worth three hundred pence expended upon the anointing of the feet of Jesus by Mary instead of being deposited with the money reserved for the poor. In all likelihood, Judas, being of the district of Judah, while the rest were all Galileans, was not impressed with the Messianic character claimed by Jesus, and therefore, merely to obtain immunity for himself, committed the cowardly act of betraying him to the soldiers and officers of the priests that came with swords and staves to seize him and his followers. He singled out Jesus by kissing him while greeting him as rabbi (John xviii. 1 et seq. ); they then seized Jesus and brought him bound to Annas and Caiaphas the high priest (Matt. xxvi. 47 et seq., and par. pas. ), while his disciples, including Peter, left their master to his destiny. The Gospels, however, relate that Jesus knew beforehand that Judas would betray him, and accordingly announced it at the Passover meal in the very presence of Judas, pointing him out as the betrayer before he left the table and immediately before the betrayal took place (Matt. xxvi. 21 et seq., 46 et seq. ; Mark xiv. 18 et seq., 42; Luke xxii. 21; John xiii. 21, xviii. 4). 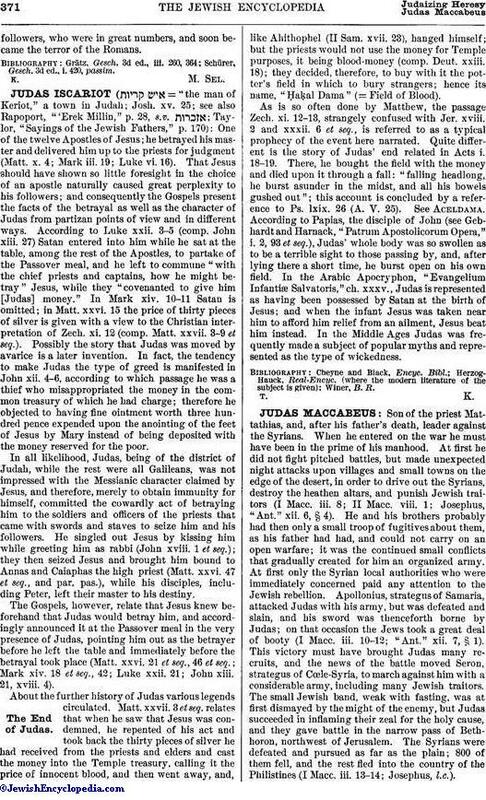 About the further history of Judas various legends circulated. Matt. xxvii. 3 et seq. relates that when he saw that Jesus was condemned, he repented of his act and took back the thirty pieces of silver he had received from the priests and elders and cast the money into the Temple treasury, calling it the price of innocent blood, and then went away, and, like Ahithophel (II Sam. xvii. 23), hanged himself; but the priests would not use the money for Temple purposes, it being blood-money (comp. Deut. xxiii. 18); they decided, therefore, to buy with it the potter's field in which to bury strangers; hence its name, "Ḥaḳal Dama" (= Field of Blood). As is so often done by Matthew, the passage Zech. xi. 12-13, strangely confused with Jer. xviii. 2 and xxxii. 6 et seq., is referred to as a typical prophecy of the event here narrated. Quite different is the story of Judas' end related in Acts i. 18-19. There, he bought the field with the money and died upon it through a fall: "falling headlong, he burst asunder in the midst, and all his bowels gushed out"; this account is concluded by a reference to Ps. lxix. 26 (A. V. 25). See Aceldama. According to Papias, the disciple of John (see Gebhardt and Harnack, "Patrum Apostolicorum Opera," i. 2, 93 et seq. ), Judas' whole body was so swollen as to be a terrible sight to those passing by, and, after lying there a short time, he burst open on his own field. In the Arabic Apocryphon, "Evangelium Infantiæ Salvatoris," ch. xxxv., Judas is represented as having been possessed by Satan at the birth of Jesus; and when the infant Jesus was taken near him to afford him relief from an ailment, Jesus beat him instead. In the Middle Ages Judas was frequently made a subject of popular myths and represented as the type of wickedness.